Soft material, good quality. Vibrant colors. 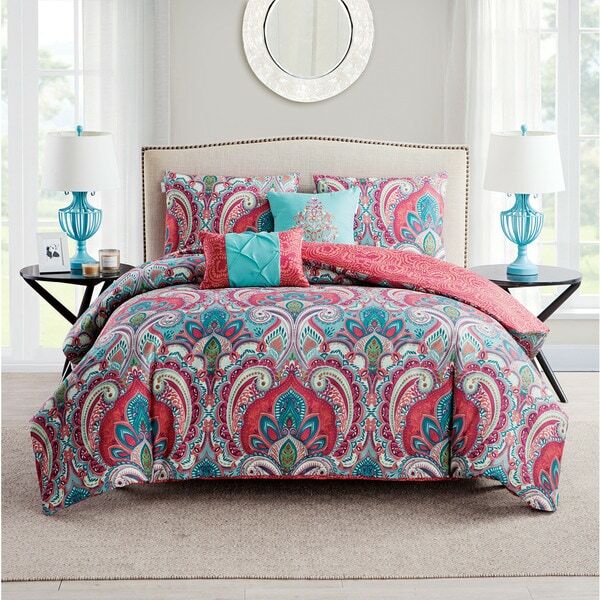 This Lancelot duvet cover set from Porch & Den has an intricate and vibrant paisley pattern in coral, blue, and green tones. An incredibly bright and fun addition to your bedroom, this duvet set includes a duvet cover, pillow shams and, two decorative pillows.These gorgeous patterns are sure to elevate your mood and catch the eye. This is absolutely beautiful. Really colorful, as the picture pretty accurately displays, and is nice and soft. I could not be more happy with this purchase. Also, I don't know if it says in the product description, but they're there ties in the corners! And my Cuddle Duds comforter has loops, so it's a fantastic fit! Also, the shams fit great and the throw pillows are actually quality throw pillows! 10/10 would purchase again. Ordered a king and it is only 90 inches long instead of 96. It has very little coral in it and the main color is really a raspberry pink. Nice quality just not what I expected. This duvet cover is very colorful. It's so Bright and fun and fits the queen duvet very well. It came with two pillows that match the colors well. My daughter loves it!! This Duvet cover is exactly as advertised. The quality is excellent and the colors are bright and brilliant. I couldn't be more satisfied with this product. Excellent value for the money. It really brightens up the bedroom. Love, love my Duvet set! I have an unusual sized down comforter. The queen size is too small and the king to big. I ordered this in the king and it's a little too big but I love it. Great quality and the colors are exactly like the picture! Very happy with my purchase and the price was great! Love Overstock products! The reviews really help you decide what to buy! I really like the duvet cover in question. It is very comfortable, plus it looks very nice on my bed. Beautiful duvet cover set!! Definetly recommend!!! Loved the colors and the textures of this duvet set. It arrived very fast and couldn't wait to get it on the bed!!! My kids love how soft the material was when they got on the bed!! I bought this for my sister-n-law. After I saw it I wanted to keep it for myself.....I didn’t. I’m a good sis. Lol. She loves the bright colors. It looks great just like ke the picture. The colors in this duvet are vivid and perfect for my daughter's room. It is lightweight and soft and the matching pillows are adorable. It is a little roomy for the twin duvet I have, but the buttons on the bottom secure it inside well. Great purchase! Love it! Brightens up our room. Soft and colorful. Definitely brightens up our bedroom! It is a really nice and durable duvet cover. I love this Duvet set so much... that I ordered a second / back-up set for down the road. The colors are vibrant and beautiful! Washes easy and fits perfectly. Order it today, you will not be disappointed. I love my bedding set, however if your partner moves around constantly like mine does it may not be the bedding choice for you. The colors are exactly as the picture shows. Its really soft and I can't wait for Christmas so I can use it... It's one of the gifts I picked out for myself. It's much prettier in person, the colors are far more vibrant. It's like Morocco meets an old hippie. 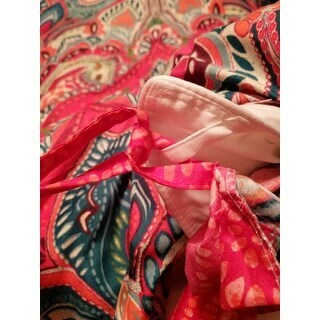 The colors are great and the quality of the fabrics are fabulous. I love it . So did my daughter. I bought her a set for Christmas. my daughter wasn’t happy with this item it’s very thin. Colors aren’t as they seen. Love the design. Just like pictured on the site. Super soft and comfy. Love the fact that it is reversible . "Does this have any pink in it or is it more coral? Thanks "
"what does this include like sheets, pillowcases and more?" 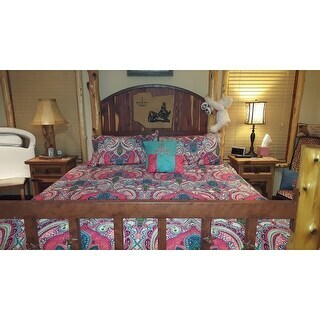 It includes duvet cover, pillow sham and decorative pillows. No sheets. "this may sound silly but where can I find the duvet that goes inside the duvet cover?" A duvet cover is used on a white comforter, usuall down or down alternative. The term "duvet cover" is redundant; a duvet is a cover, like a huge pillow case with buttons to close the end. If the material is opaque the duvet can be used with patterned comforters, but generally a white comforter is better. 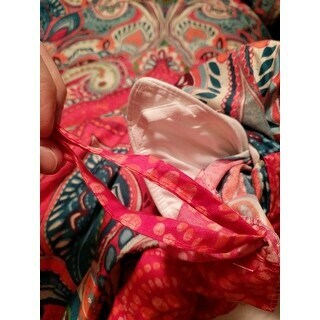 "Button closure or tie closure "